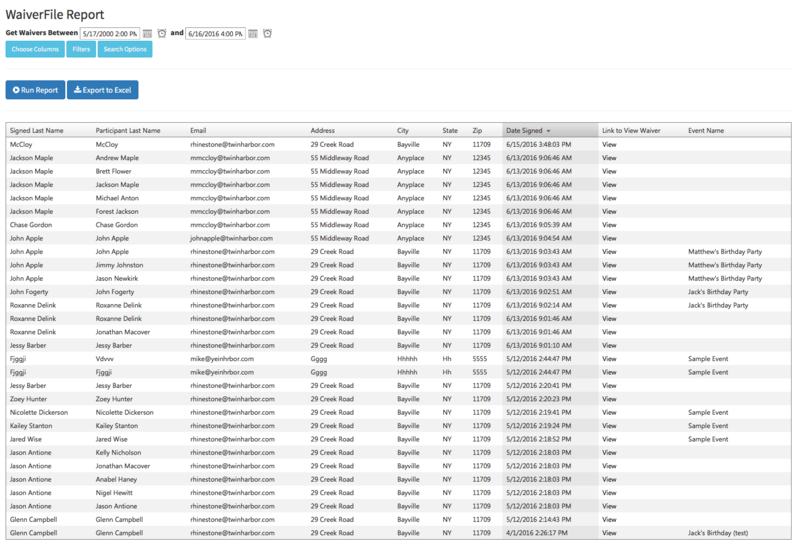 WaiverFile includes a powerful reporting tool that will let you find the data you are looking for quickly, and export it for use in other applications. To access reports, start by logging into your WaiverFile dashboard and select Reports on the left side. Once there, you will see several options for generating reports. The first is the date range. Select the range of dates you want to collect data for. Then click Run Report to see the results. This will show all waivers collected in the date range specified. When you first run the report, the default set of columns is shown, but you can turn on any others that you wish. To do this, click on the Choose Columns button. You’ll be able to select any combination of columns to include in the report, including any custom fields that you created in your Waiver forms. To sort your data, just click on the column headers. They will start by sorting in ascending order. Click the column header again to sort in descending order. Let’s say you want to find all participants who lived in a particular city. Click on Filters, and add a filter that says City equals the name of your city. Click Apply, and then Run Report. You can set filters like this for any field, including your custom fields. Filters can also be set to compare values using ‘Equals’, greater than, less than, or other terms. Select whatever makes most sense from the drop down list. You never know what kind of report you may want to run down the road. WaiverFile’s report tool has the flexibility you need to create the reports you’ll need, no matter what you think of down the road. Click on the Search Options button to configure a few additional search options. The first is Search by either Date Signed or Event Date / Date Attending. This affects how the date range is applied. By default, the dates searched are based on when the waiver is signed. You can instead choose Event Date / Date Attending, which will load waivers for all visitors based on the date of the event they were attending, or the date they said they would arrive (signed in advance), even if they completed their waiver days beforehand. The second search option is to include waivers signed for either General Admission, events, or both. By default, results include both, but you can choose the other options depending on what data you are looking for. Once you’ve created your report, you can save a copy of the data by clicking Export to Excel. This will let you download a copy of the result set in Microsoft Excel format. You can then store a copy of the data, or open the data in excel and manipulate the data as needed. You can also use this to export customer data to other services, including email services that you can use for marketing purposes. Are there additional features you would find useful? We are always looking for customer feedback. Real-world feedback from our customers has helped us shape WaiverFile into the product it is today, and will continue to do so in the future. Please contact us with any comments or suggestions - we’d love to hear from you!